LucidCam is a hemispherical 3D camera (previewed here). Its videos are similar to 3D 360 videos but the field of view is limited to the front hemisphere. – 32GB internal storage, 2GB RAM. Also has a Micro SD slot. 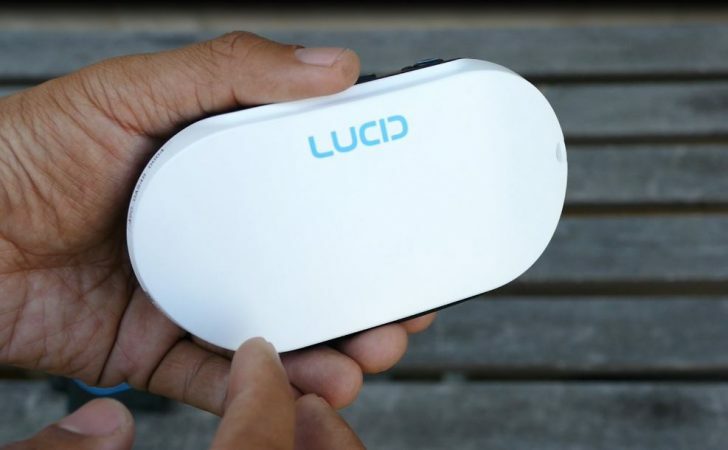 LucidCam is one of the first, if not the first, 3D 180 camera for consumers. It was launched as a crowdfunded camera in November 2015 and shipped to backers a couple of months ago. At around the time they shipped to backers, Google announced the very similar VR180 format, which gave validation to the idea of capturing 3D 180 (instead of 3D 360). 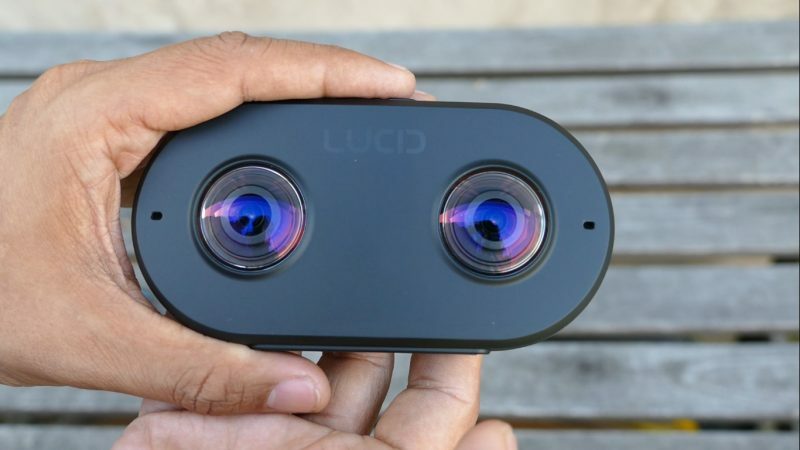 LucidCam’s 3D 180 and VR180 are both designed to be viewed on Google Cardboard or a similar headset. When viewed that way, they both look like 3D 360 videos that have empty space at the rear hemisphere. The difference between LucidCam’s 3D 180 and Google’s VR180 is that when you’re not viewing VR180 in VR, the view is fixed, just like a non-360 video (i.e., you can’t swipe or use a magic window). LucidCam said they are working with Google to have LucidCam certified as a VR180 camera. If that happens, then I am assuming there will be an option to save in VR180 format. I’ve had the chance to shoot with LucidCam for a few weeks and here are my first impressions. The camera is very simple. The front has two circular fisheye lenses. The back is empty except for the LucidCam logo. On the bottom of the camera is a 1/4-20 tripod mount, and a rubber cover for the Micro SD, Micro USB and Micro HDMI ports. One the right side is a shutter and a Wi-Fi button. When you activate the Wi-Fi, you can connect to the camera with the app, available for both iOS and Android. 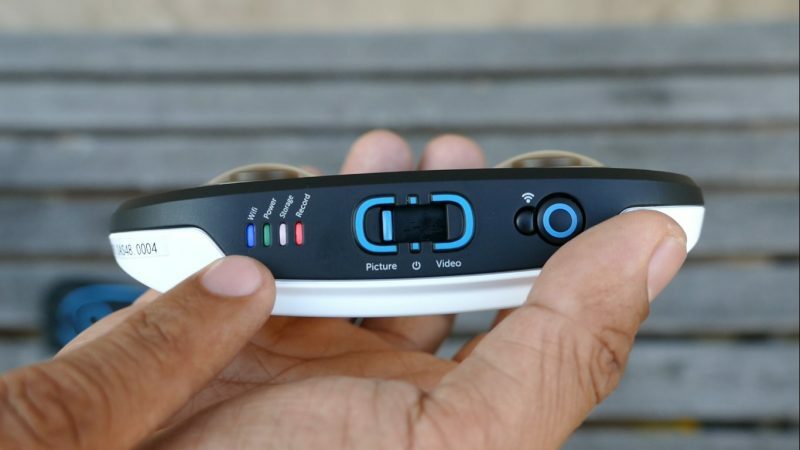 LucidCam can create either a side-by-side video (similar to a non-360 3D camera), or it can create output that is compatible with 3D 360 top / bottom format (with the rear hemisphere either empty or mirrored). To create the 3D 360 format, you need to switch to equirectangular capture, then use the YouTube converter which will create a 3D 360 copy of the video. Shooting with the LucidCam is very easy — I found it much easier to shoot with it compared to 360 cameras. With 360 cameras, I try to visualize the location and how the viewer would feel if they were there. I also have to consider where to hide, or at least where to place myself. With LucidCam and other hemispherical cameras, my approach so far has been simply to compose for it the way I normally would with a regular ultrawide lens on a non-360 camera. I have to admit it is a relief not to have to worry about how I look in the photo or video. 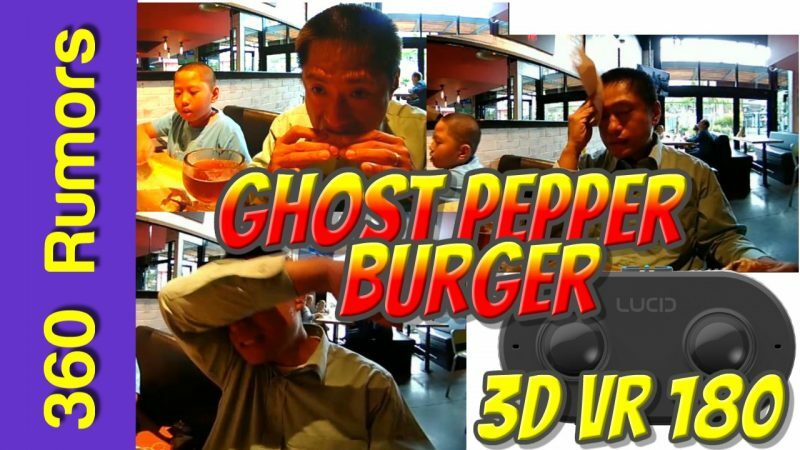 Here’s a sample video from LucidCam, as you watch me eat a ghost pepper burger! The video was taken before LucidCam posted a firmware update that increased the resolution to the equivalent of 4K per eye (the video file is 4096 x 4096 but half of the field of view is either empty or is just mirrored). UPDATE: Here are sample photos in 3D 180 format, which I uploaded to Orbix360 (currently the only platform that supports 3D 180 photos). I also made some full resolution sample photos and a sample video available for download here. LucidCam said they have an important update coming, so my plan is to post a full review after that update. Meanwhile, I think 3D 180 / VR180 looks quite promising! If you’re interested in LucidCam and other 3D 180 cameras, please join the Facebook VR180 group. VR180 is the way forward for the immediate future. Best not to get closer than 5 feet to the camera or else the 3D breaks down terribly. The lenses on the LucidCam are definitely “consumer”, better glass is needed regardless of resolution (see the “Charlie Puth in London” VR180 video on YouTube for an alternatively shot VR180 experience). I’ll be interested in seeing the Lenovo/YI VR180 camera offerings this winter. Thanks PM! Hmm on my viewer, the 3D looks correct, except for the very near objects like the condiments. But someone else commented about the distance, so next time I’ll move farther back. Re VR180, the specs aren’t out yet but some VR180 cameras could have a higher resolution compared to LucidCam. I know the Z Cam is 6K equivalent. I’m also curious about the price. Now we know the price of the Zcam at 3K USD, the LucidCam looks ever more attractive for its pricepoint. Each time I make a simple enquiry about details of the Zcam K1 Pro, the Zcam folks keep trying to invoice me for a unit. That customer service is rather off-putting. Are these sample photos straight from the camera? They are 1600×800 and look quite pixelated in VR. Could you post the full-res? Also, does the camera allow you to export the original fisheye pair? Fantastic, thanks! Pretty nice quality and depth. It’s strange that the scene is not captured at exactly the same time for both eyes, the right eye is later. It creates rivalry when things or people are moving. I didn’t notice that but that’s an interesting observation! I’m using the latest firmware and both lenses are in sync on mine. Ricoh Theta’s new generation Theta to be showcased on Sept. 1 at IFA Berlin!